Second term starts on the week of 7th May and consists of 9 weeks of classes, during which the students will learn the basics of rhythms and movement. This program is designed to help children develop coordination, musicality, rhythm, self confidence, discipline and ability to participate in activities as part of a team. The cost for Term 2 is $70 for the 9 classes or $110 for attending twice per week – 18 classes. Please contact me if you have more than one child in the family wanting to enroll to negotiate a disounted rate. Each class is 45 minutes long. Please note that there are no refunds due to sickness, injury, holidays or other reasons. Our costs are fixed and it is your responsibility to make sure that no classes are missed. We recommend attending the whole course as missing classes will impact the learning process. However, a casual rate of $10 per child per class is available. We find that parents are a distraction, so we do not allow parents to stay for the class. However you may come for the last 15 minutes of the last class of the term to watch what your child has learnt. With time we will also work on dance technique/ strength and flexibilty. Please note that we need a minimum of 6 enrolments and a maximum of 15 for the course to go ahead. Second term starts on the week of 7th May and consists of 9 weeks of classes, during which the studetns will learn the basics of Salsa in the Beginner class and progress to more complicated variations in the Level 2 course. The cost for Term 2 is $81 for the 9 classes. Please note that there are no refunds due to sickness, injury, holidays or other reasons. Our costs are fixed and it is your responsibility to make sure that no classes are missed. There may be optional perfomance opportunities at the end of come up. Costumes, shoes, travel and other performance related costs are additional. These will be advised in advance and will help you decide if you would like your child to perform/ compete later. There is no pressure to participate in the performances. Salsa is a great way to learn coordingation, musicality and rhythm. We will also work on dance technique/ strength and flexibilty. 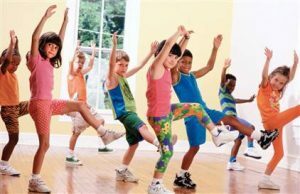 Dancing Salsa also helps children develop team work, social skills, leadership skills, good self esteem and goal setting. Please note that we need a minimum of 6 enrolments for each age group for the course to go ahead. Smaller group classes will go ahead at the discretion of the instructor. By signing up to our courses you agree to our terms and conditions. Please read them carefully. Once you pre-pay, we will email you a form to complete as well as some basic instructions for the classes. Anyone 18 years old and above can attend our adult classes. Click here to enroll in the 5-7 year old General Dance Classes. Click here to enroll in 10+ year olds Salsa Courses.